This survey gathers needed information about the workshop. Visit here to complete survey. Once the survey is received, Chuck Konkol from Rock Valley College will email workshop facilitator the details about picking up the Ozobots from Rock Valley College. We suggest at least two volunteers to walk around and help as needed. Post event on website, social media and contact local media. The email sent from Chuck Konkol will have details of when and where to pickup the Ozobots for the workshop. Every facilitator, student and volunteer should have one 1/2 inch binder with clear cover. The binder will have a cover sheet and be filled with content from binder download files (see next bullet). 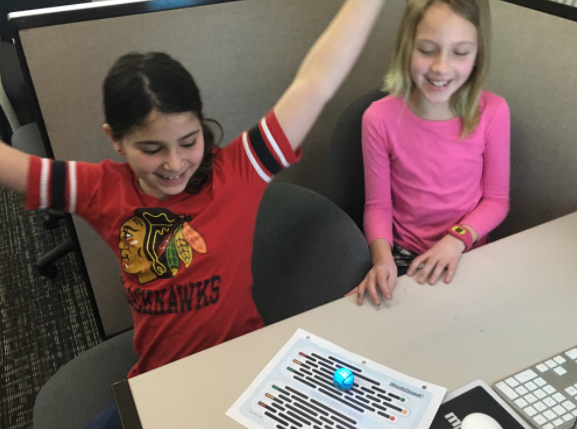 Facilitator and volunteers should practice with an Ozobot and go over workshop content by getting familiar with the binder and online curriculum. Put binder and Ozobot on table near computer for each student. This survey confirms what was completed in workshop and also allows to upload photos and video of event.